Quickie Jive M Powerchair ultimate driving experience. JIVE M - indoor agility with the ultimate outdoor high performance. Turning on its own axis, its ultra-small turning circle, narrow width and low seat-to-floor height gives excellent manoeuvrability indoors. Going out? SpiderTrac suspension helps to navigate onto and over steep transitions without jolts, forward pitching or instability. With expandable controls, 13kph top speed, 60/70 Ah batteries and up to 40km range, high performance power will always be at your fingertips with JIVE. With SpiderTrac, a gas suspension system is used to dampen the impact without adding pressure to the castors. 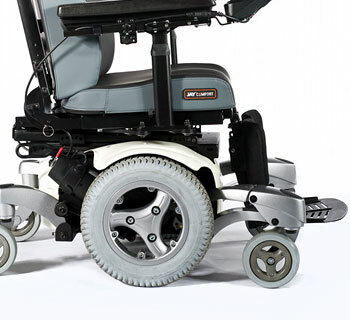 By maximising the articulation range of the front/rear castors, the JIVE M has a spider-like ability to crawl smoothly onto and over steep transitions - so when you're ascending or descending a kerb, the gas dampener cushions the impact of the castor wheel. This ensures not only super-smooth transitions without jolts, jarring and forward pitching, but also keeps you seated in a stable position. 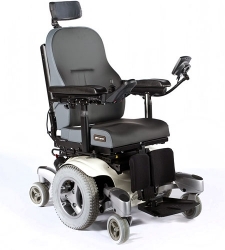 Due to its tight turning circle, the JIVE M is intuitive to drive as you don't need to consider additional space for swinging the chair around (ideal for those who may have difficulty driving a powered wheelchair or using switches/head controls). Your seated position also adds more weight on the drive wheel - perfect for increasing traction and decreasing sliding when outdoors.